Kauto Star will have to prove his Gold Cup fitness during a racecourse gallop at Wincanton this Friday. 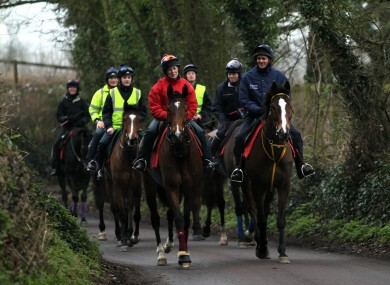 Kauto Star, front right, makes his way back from the gallops (file photo). PAUL NICHOLLS WILL send Kauto Star out for a gallop at Wincanton to judge the 12-year-old’s fitness ahead of next week’s Cheltenham Gold Cup. Kauto upped his recovery again yesterday with two canters in Nicholls’s Ditcheat yard, and all the indicators suggest that the dual Gold Cup winner may be ready in time to challenge Long Run in next Friday’s showpiece. But Nicholls warned fans not to get carried away by Kauto’s encouraging progress and said that he will have a better idea of his star’s health after Friday’s racecourse gallop. “He had a racecourse gallop before he won the Betfair Chase and I thought it a better idea to give him a spin, and a good workout, on the grass away from home,” the trainer wrote on his Betfair blog. “Ruby will ride and he will work with Mon Parrain. “Everyone can make their own minds up as to how he looks and works. And if he does come through that ok, we will look to school him on Monday morning. But I must stress that it is one step at a time, and it is important that people don’t get carried away. We aren’t, just yet. But we are heading in the right direction quickly, it seems. Kauto Star’s odds for the Gold Cup drifted out to 4/1 after a bad fall during schooling threw his participation into doubt. Defending champion Long Run is currently priced at 15/8 favourite to win the race for a second successive year. Email “Nicholls sets Wincanton test for recovering Kauto Star”. Feedback on “Nicholls sets Wincanton test for recovering Kauto Star”.